Before I begin the answer from a travel enthusiast perspective, just some insights to share about Asia and India in general, might give you some perspective pertaining to the question you have asked. Some interesting facts about the travel Industry in India & Asia in general. Over the next few years, Asia — mostly China and India — and Latin America will drive world economic growth, contributing up to 75% of global GDP from 2010 to 2012. The 2012 outlook for Asian outbound travel is positive. 6 to 8% increase in this year’s expected 14% growth. In particular India appears to be set for strong growth with 43% planning more outbound travel next year. IPK’s travel confidence of India is at a high 113 points. I began exploring India truly about five years ago and I’d say despite traveling to a lot of parts, I hae hardly touched 1/4th of the country so far. An endeavor that makes me want to go on and on till I have set foot across each and every state at least. One of the reasons why I enjoy doing so is cause of it’s geographical and cultural diversity with of course significant historic and mythical relevance to various places. Adds to it’s mystery in its own way. To such an extent that every different place that you travel to within India is a completely different landscape and a cultural expose of sorts. There is a great sense of encompassing travel experience that yuo get when you explore various parts of India. From the beautiful mountains in the Himalayas to the amazing temples and the beaches down south. From the most diverse religious and cultural places across the four corners of the country to the much modern and very well built cities in various metropolis. From the multiple Indian languages spoken in different parts to the very familiar tour guides or audio guidebooks that you’ll get at various heritage sites to help understanding places in the country much better for yourself. India has it all. If you are the type who loves adventure and mountain climbing then you can explore various destinations across the Himalayas which span across the Indo-Nepal-Tibet and Pakistan border you’d love every bit of it. There are practically every kind of geographically diverse landscapes in Leh and Ladakh. If you are interested in culture and meeting new people of ethnic and traditional origin then a trip to Uttar Pradesh, Rajasthan, and some remote villages in Harayana, Punjab and some parts of South India would do the trick. Archaeology fans might really enjoy The Ruins of Hampi, various parts of Gujarat and some across India-Pakistan border where Indus valley civilization ruins exist and of course Madhya Pradesh for it’s beautiful terrain and charismatic caves depicting ancient lore of Kama Sutra and love in Khajurao. Mumbai, Delhi, Kolkata, Chennai, Bangalore are the metropolis you might want to go to, best serve as connectivity to various different parts and mostly flights to any place in the world or other part of the country are available here. South India give s you a lot of insight on the Hindu cwith it’s various temples and also a great escapade towards nature in God’s own country Kerala will enchant you with it’s beauty. The North East has it’s own charm with various landscapic mountains, monasteries, Buddhist culture and an eye awakening spirituality towards nature and this planet. Then there are the beautiful islands of Lakshwadeep and Andaman and Nicobar which are a place in itself. Secluded from most parts of India they lie within the terrains of water a world within their own these places must not be missed. And last but not least, there’s no place like Goa! If you come to India, Goa is a must visit for…. Of course there are pitfalls when it comes to hygiene, beggars, lots of crowd, the problem of communication at times in certain parts. The potential risk of being duped by locals or overpriced at various destinations are certainly there… But if you are aware and well educated about your destination with some planning and research, yo can get along well with any of those situations. Plus that in itself is an experience for you so to speak. Overall, India tourism is trying to create infrastructure and overall awareness for its tourists and travelers. You’ll find a lot of information on this website and also if you carry the India Travel Guide book, which most tourists and travelers from the world carry with themselves you should be good to go. In most places local authorities, police are quite helpful, sometimes you may have issues with the bureaucratic ways of the cops and local authorities, but if all your paper work is good then mostly there are no worries. What are the Places to travel to? Visit the Ruins of Hampi – A must visit if you are a fan of archaeology and historic ancient culture. Haridwar for it’s cultural and spiritual expose. 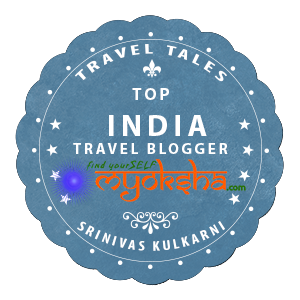 This entry was posted in Travel Answers on Quora and tagged Bangalore, Delhi, Goa, Gokarna, Incredible India, India, India Backpacking, India traveler, Mumbai, North India, Rajasthan, South India, Travel, Travel Destination India on November 18, 2012 by srinistuff. India is without doubt a best travel destination. Just because of diverse culture and climate at each step. Everything and each activity is possible in India, typically a traveller wishes. Here is Himalaya Ranges for trekking and some adventure, Rajasthan for heritage sites, Kerala for backwaters, Goa for Beaches and off course there are even more great places to visit.